(APR. 2, 2019) HOUSTON - IBC Bank employees from branches across Houston delivered a donation of over 6,000 books to Port Houston Elementary School in Houston ISD during their Minitropolis® spring showcase on Friday, March 29. IBC employees spent the past few months gathering book donations from customers and the community through decorated collection boxes featuring photos of the Port Houston students, placed in each of IBC Bank-Houston's 14 retail locations. They also solicited donations through a targeted email campaign to customers and partners and from other IBC Bank markets across Texas. IBC employees began the Port Houston Book Drive after discovering empty bookshelves in the school's library. "While preparing for the grand opening of Dolphinville, Port Houston's Minitropolis®, we couldn't help but notice the empty bookshelves in the school's library. There were just not enough books for the number of students in the school," explained Anness Jensen, first vice president and retail division manager for IBC Bank-Houston. "Our employees immediately got to work collecting book donations from coworkers and customers throughout the community." IBC has been partnering with Port Houston since December on the city's first-ever Minitropolis® program, a student-run "mini city" that offers students an opportunity to see how a community operates by "employing" them in a variety of real-world positions in mini stores and mini city government. On Friday, officials and teachers from across Houston ISD were at Port Houston to experience the unique program in person. The showcase featured a tour of Dolphinville and a Q&A with Port Houston staff and visiting guests, including District H Councilmember Karla Cisneros. The program ended with the delivery of over 80 boxes of books to Port Houston's principal and students during a special presentation in the school's library. 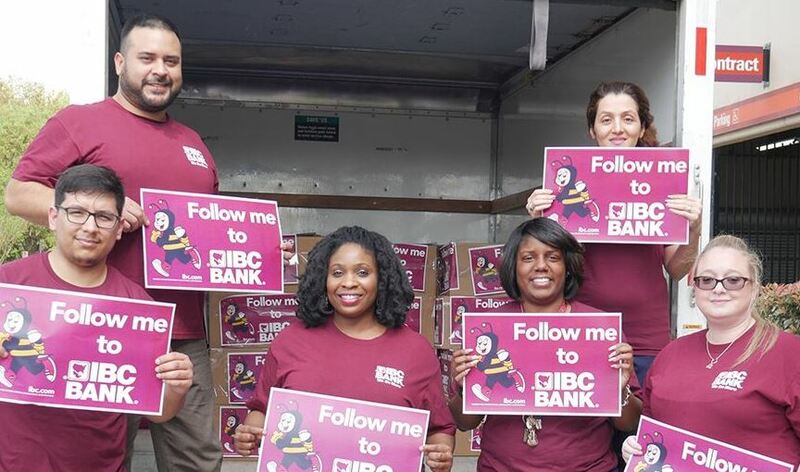 "The banking industry has an obligation to ensure that the communities we serve have access to financial education tools and resources, so that all generations are equipped to lead fiscally responsible lives," said IBC Bank-Houston President & CEO Jay Rogers. "While Minitropolis® focuses on financial literacy, we saw that Port Houston also had a need for general literacy support. The ability to read and write is the most basic foundation of education, and access to books is key in combatting illiteracy. I am proud of our employees for stepping up and collecting books for the students at Port Houston." Minitropolis® is a financial literacy program that was created by IBC Bank in 1996 and currently operates in close to 30 elementary schools across Texas. The program prepares students for social and financial situations they will experience in adulthood through an interactive environment and exciting, hands-on learning. IBC Bank at Dolphinville allows students a chance to earn "Dolphin Dollars" for demonstrating leadership skills, and teaches them about adult responsibilities related to money-management, such as managing their balances, writing checks, making deposits and withdrawing money. Dolphinville is open every Friday for students to practice social, academic and real-world life skills working as employees at IBC Bank at Dolphinville, Kroger, Crime Stoppers, Port Fit Gym, The Green Thumb Co., the Daytime Movie Theater, the Post Office, and the treasury department. "I am so proud that Port Houston is the very first Minitropolis® in Houston. Dolphinville has had a tremendous effect on our students already, and I am excited to show it off to the rest of the school district," said Victor Garcia, Port Houston Elementary principal. "I am also extremely grateful for IBC and all of the support they have provided our students throughout the Minitropolis® process. From arranging filed trips to the bank for our students, to this donation of over 6,000 books, IBC's partnership is setting our students on a path for success and playing an integral role in their educational growth." IBC Bank-Houston is a member of International Bancshares Corporation (NASDAQ: IBOC), an $11.9 billion multi-bank financial holding company headquartered in Laredo, Texas, with 189 facilities and 287 ATMs serving 89 communities in Texas and Oklahoma. IBC Bank's slogan "We Do More" reflects the bank's dedication to the growth and success of the customers and the communities it has been serving since 1966. International Bancshares Corporation was ranked 22nd on Forbes' prestigious list of 100 Best Banks in America in 2019. IBC Bank-Houston has been serving the area since 1997 and has a retail branch network of 14 locations. MEMBER FDIC / INTERNATIONAL BANCSHARES CORPORATION. Follow our Facebook page, @IBCBankWeDoMore. More information is available at ibc.com.